Now that the new dual carriageway has opened, most atlases will only confuse you! 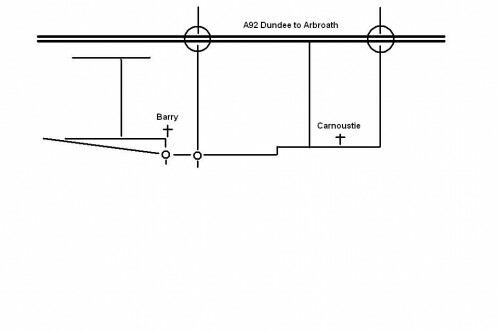 Follow the A92 from Dundee, turn off following the signs for Carnoustie, at the first roundabout turn right, at the next roundabout (with the new Barry bypass) turn right again onto the Main Street through Barry. Directly ahead on the sharp bend is the Church. From Arbroath take the second main junction to Carnoustie (after the Muirdrum bypass and the half-junction signposted Balmachie) and follow the directions above. The map below is schematic, and does not show the sharp bends in the roads South from the A92.